We are in the 11th day of the 13 day period that starts with day 1-Cipactli (Crocodile) is ruled by Tonacatecuhtli, Lord of Nurturance, the primordial god of creation and fertility. 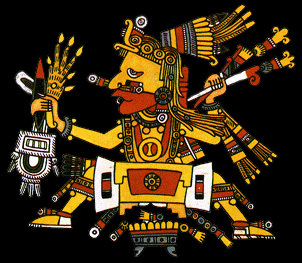 Cipactli is god of the land, the great earth monster, floating on the sea of stars. This is the first trecena of the sacred year. The 13 days of this trecena are governed by the primordial urge to create order out of chaos. The three means by which the Old Ones established order are still our most important treasures: speech, agriculture, and the family. The lineage of thought runs from seed to fruit to seed: these are good days to participate in the community; bad days for solitude. Lord of Our Sustenance, is a primordial creator god, a god of fertility and beginnings. Tonacatecuhtli is the being at the “center” of existence, a place around which everything revolves but where everything is still and at rest. Knowing about the Aztec calendar can be very useful when making daily decisions. If you think about how our ancient ancestors spent so much time recording a system that spans past their lifetime is amazing alone. They scheduled their days based on this and we can too. A time for study and practice, and a time for activity. This is only half of the information. You can also look at the daysign and the ruling god behind it to see how they all work together! Here is a link to a great site that can help you. Its always nice to look up your birthday first.